Shining Force III Scenario 1 ~Outo no Kyoshin~ (シャイニング・フォースⅢ　シナリオ１　王都の巨神) is a Simulation - RPG game, developed by Sega Enterprises, Ltd. / Camelot / Sonic! 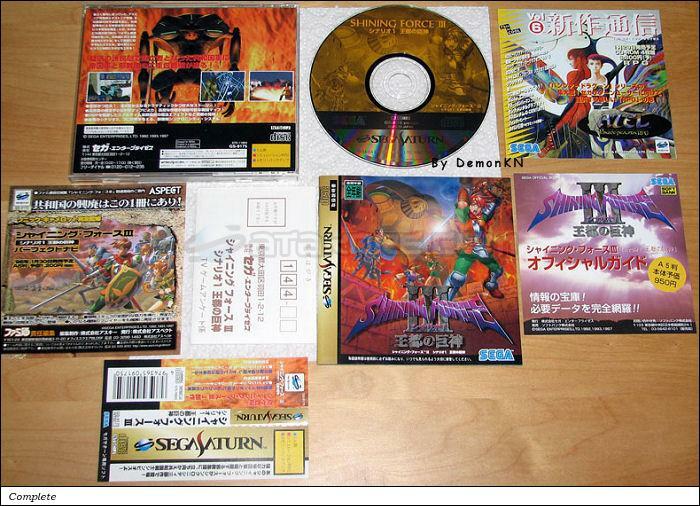 Software Planning and published by Sega Enterprises, Ltd., which was released in Japan in 1997 for the Sega Saturn. There's no need to do the presentation of the most popular tactical-rpg along the sega fans. When the new Shining Force came out in early 1998, it was absolutely gorgeous for a full 3D Saturn's game: no loading, amazing animations, symphonic music, brilliant graphics (only lacked a bit of variety), astonishing spells and skills, impressive summomnings, and great replay value. The only minor grief about this third episode is that the story is on 3CDs you have to buy separately. In one word: essential to all Saturn's owner.